Bartender's warning : This post is best read with ear-phones plugged in. Like the movies, the music soundtracks too were generally formulaic. Yet, there were a few diamonds that emerged from the rubble. These were albums that were instant hits when they arrived and now, even decades later, have weathered the test of time pretty well. Pardes, Jab Pyaar Kisi Se Hota Hai, Aur Pyaar Ho Gaya, Gupt. In addition to the above list, there were umpteen one-hit wonders ( Criminal, Papa Kehta Hain, Parinda, Phool aur Kaante, Hum Hain Rahi Pyaar Ke ). A funny coincidence to note in the list above and below is the Khan-centric nature of musical hits. I didn't do that on purpose - it's just the way it was back then. Luckily, the decade that followed would change that trend for good. Now, shall we see the top 10 soundtracks of the 90s in Bollywood ? Ismail Darbar's first stint as a music composer. It would also end up being the best he could ever do. This magnum opus love story featuring Salman, Ajay and Aishwarya was a huge hit for it's time even by Bollywood standards and cemented Sanjay Leela Bhansali's place as a director to bank upon. Before Sanjay Leela Bhansali had unlimited funds to spoil himself with ventures like Devdas and Guzaarish, his first tale was of a simple love story between a girl born to deaf-and-dumb parents and a young lad, set against a poor economic background. What I still remember from nearly 2 decades ago is that after dominating the charts ( Philips Top 10, anyone ? ) for months, the moment the movie reviews came out cold, the songs of this Jatin-Lalit album disappeared off the charts. I always wondered about that logic - letting worse songs come to the top just because the movie tanked. One of only two non-Khan films in this countdown. Rahul Roy and Anu Agarwal had a dream debut in this very sweet first-love tale that had some very romantic numbers interspersed right throughout the narrative. Okay. Put on your seatbelts. The Shah Rukh Khan juggernaut begins. DDLJ was, is and will always remain, one of Bollywood's biggest hits. The combination of a loveable pair with great on-screen chemistry, a setting that we can all connect with ( you know - a millionaire college-flunking kid taking a trip to Switzerland and falling in love with a desi girl and running with his equally insane dad all the way to Punjab to elope with her. ) and some great songs yielded phenomenal results. DDLJ maybe the bigger hit, but KKHH would wow the crowd with the same combo in a totally different setting two years later. 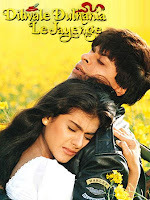 Truth be told : I personally liked this movie better than DDLJ. The SRK train rolls on. 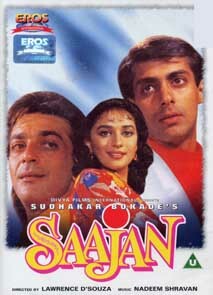 This was a phase where Yash Raj films could do no wrong. They had the whole 'cool-dude teenager falls in love' hit formula stashed in their pocket. And DTPH was the best example of that - 'kids' with no back stories, involved in a pretty mundane stage play, fall in love. Fun fact : After featuring the love triangle of SRK, Karishma and Madhuri heavily in the promos, having Akshay Kumar play the hero of the title song proved to be a pleasant surprise. It would also prove to be the turning point in his career. Mani Rathnam. A R Rahman. And then Shah Rukh Khan. This tale of a guy falling in love with a suicide bomber had a lot going in it's favour but would ultimately collapse under the weight of it's own expectations. Still, there is a lot to be thankful for - strong performances by the leads, a vivacious debut by 'Liril' girl Preity Zinta and of course, the magic of A R Rahman. Much like in his yearly professional life, there's just a single Aamir Khan movie in this list - but oh - what an album it is that can leap-frog over the more technically superior Yash Raj-ShahRukh-Swiss Alps bandwagon ! Instant classics : Dil Hai ki Manta Nahin, Tu Pyaar Hai Kisi Aur se, Adain Bhi Hai, Kaise Mizaaj Aapke Hai. Fun fact : All the 11 songs in this album are sung by Anuradha Paudwal. Respect. Lawrence D'Souza used to deliver simple but sweet movies back in the early 90s and the best of the lot is the eternal Bollywood love triangle between the handicapped poet with a heart of gold ( Sanjay Dutt - yes kids, he wasn't a don in every film he played ), the fan in love with this person she has never met ( a gorgeous Madhuri Dixit in her prime ) and the spoilt brat ( Salman Khan v.01 at his best ) who loves her. Back then, Ooty was the 'Swiss Alps' of dream sequences but with songs like these, that was all our generation needed. You can say 'But it's dubbed!'. Doesn't change the fact that this was a game changer in Bollywood music. Composers realised that there were more wonderful instruments than a organ, a synthesizer and a jazz / drum set. They also realised that this unknown kid from down under ( Chennai ) was gonna be a major name in the days to come. And boy, did A R Rahman prove them right. Songs like 'Yeh Haseen Wadiyan', 'Tu Hi re', 'Choti Si Asha' and 'Roja Jaaneman' don't just showcase the finesse of Chitra and SP Balasubramiam, they almost instantly transfer us back to our younger 90's self and you feel the memories flood in of how enamoured you were by these songs back then. As with any countdown list, there will be a difference of opinion. That's fine - but be honest : While reading these songs, you were mentally humming them in your mind, weren't you ? What a yummy list ....... am going to go home today and listen to EACH of these numbers again. Truth be told, when I saw the list that didn't make it I gave sharp little indignant noises when I saw Rangeela, HAHK,and Bombay (which I thin still should be in the list). But after I saw the list, I just had to nod at each entry - except maybe Dil to Pagal hai .... a Bombay was better, no? When making the list, I first wrote down 35odd albums and then started re-ordering them... in the final list to be trimmed : Bombay, Aur Pyaar Ho Gaya and 1942: a love story were the ones to get the shaft. Frankly, I hate all of these reality shows. And while there are so many hits today, the truly memorable songs are still far and few between. Just listen to the beauty of Roja's songs, be it the serenity of Yeh Haseen Vadiayn or the pathos of Roja Jaaneman... how many songs can you name from this year (2012) that could compete with that ? oh yes.. that is indeed an 'exceptional' number !! I love Bollywood. No matter how old we get there is always great music to look back to. Period. I so totally love the list! I have one fav song though, it is 'Mohabbat ho na jaye' from the movie which starred Lisa Ray and Aftab. I heard that song over and over many times on the walkman then ! That too I guess is a one hit wonder and the movie went unnoticed. oh wow.. I totally forgot that.. and yes, it was a really nice album. Used to love 'mai Koi Aisa geet gaaon' and 'Ek din aap yunh'. Thats the problem with making this list - you always end up meeting missing a few. You're rt ! forget the top 10 list and even just look at the consolation list - even there I had to cut off some like Pather Ke Phool, Darr, Barsaat... I added Yes Boss now after you told me.. how many more missed my eye, God knows ! All these songs are in my favourite's list. I remember most of them word by word :) and I still listen to them frequently..
Share the list.. I wanna see more opinions !! Surely there are more people of the 90s around !! I'll be honest.. I totally forgot about Taal. Thats the problem.. even if you try, you still forget a few. And yes, Aaye Ho Mere Zindagi mein is one of my personal favs too.. Absolutely loved the list! The runner up list was awesome in itself and the excitement grew too much in the 2 secs it took me to get to the winners list. Went down memory lane into my teens. Remembering where I saw each of those movies and with whom brought a big smile on my face. Thank you for the great "me" time this post provided on a Sunday morning when everyone at home is still sleeping. Exactly.. even I carry certain specific memories from my childhood with most of them albums... this was like a chance to walk down memory lane. I had fun with my earphones on. Thats just the thing - these songs endured. Even today, when you travel by bus, you hear the albums I mentioned being played..
Well, it is after all your list but Saajan & Dil Hai Ki Manta Nahin over Rangeela and 1942: A Love Store? I don't know when I last listened to 'Bahut Pyar Karte Hain' or 'Tu Pyar Hai Kissi Aur Ki', but I would still search my library to hear 'Rangeela Re' or 'Ek Ladki Ko Dekha To'. That's the thing with lists - everyone has a different opinion. I suggested my list.. everyone's free to add or modify based on their personal likes. Hi rhoshan..this is rly nice to see all the 90's songs...i have made a playlist in my phone & keep listening to them. There were some non-filmi songs too.. can you make a list of them also? You're absolutely right... reducing the list to 10 made for some tough cancellations which deserved better.. 1942 a love story, taal and rangeela being the main ones. Wow. top 10 albums. That will take some thinking.. will see how to go about it. Nice collections. I love songs of Khamoshi they are amazing and just so soothing. This is amazing collection. Bollywood is the best film industry in the world it has the unique way of expressing emotions. Honorable mention to Taal. Ishq Bina is one of the best songs of all-time. True.. many here did feel Taal deserved an entry above some of the others. I'd rather they get quality movies from streaming channels instead of splurging on brand new ones, there are lots of great movies they don't have and a lot of terrible ones they do have.